Cabinets BLAST SOFTLINE are our standard blast cabinets made by professionals for professionals. BLAST SOFTLINE cabinets are ergonomically designed for day-to-day sand blasting in maintenance and production workshops. Cabinets housing is made from powder painted sheet metal and has a wing door from the right side for easy loading. The tilt-out window is designed for tool-free glass change in minutes and equipped with fluorescent light for best visibility. Front openings for hand access are equipped with two layers of rubber sealing flaps. Galvanized steel gratings in the working area provide the best support for even heavier parts up to 300 kg. Blasting is foot operated and interrupted by a safety switch if the door is opened.  BLAST SOFTLINE cabinets can be equipped either with injector or pressure blasting system and optionally connected to dust collectors with or without cyclone for abrasive recycling. Actual space requirement for a complete system depends on the equipment configuration, options and requested workflow. Care also about additional workspace for the operator and for maintenance access.